I'm one of the biggest saison afficiandos on the Northern side of the border, I love the citrus, zesty, coriander filled deliciousness that makes it perfect for savouring in late winter and in early summer, so quench worthy and a half! 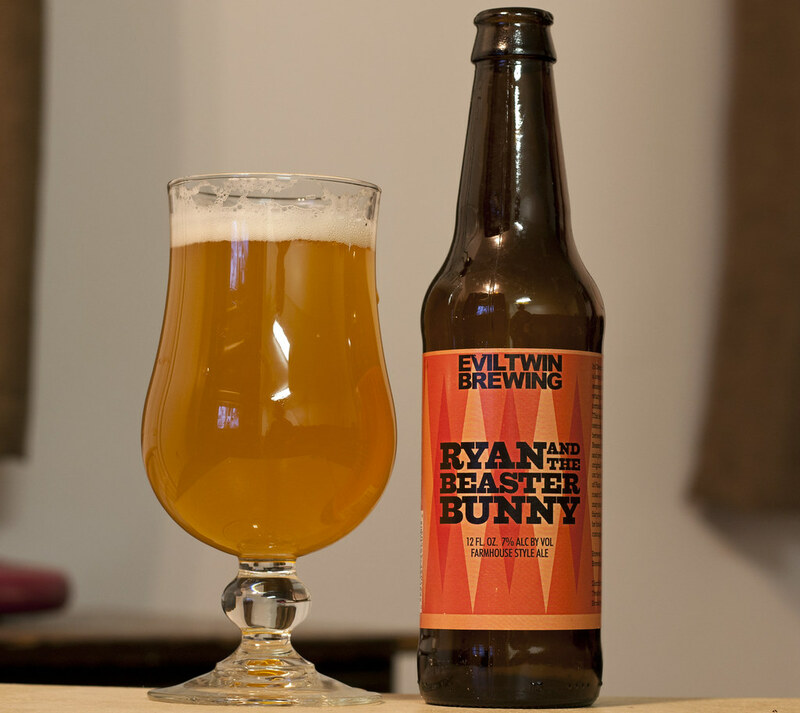 Today I'm trying out Evil Twin Brewing's Ryan and the Beaster Bunny, which, itself is an awesome name for a beer, this is the same brewery that has a beer called "Hipster Ale." That alone makes me laugh. Excited to try yet another saison - I can never get tired of them! Apearance: A standard Belgian-style wheat ale saison, a really bright golden orange ale, dense as the night is long, unable to see through it, some sediment, nice amount of carbonation, very cloudy. Eggshell white head, a really creamy head that's sticking to the side of the glass. Aroma: Sweet aromas of coriander, orange peel and lemon citrus zest. Great amount of Belgian yeast to give it that je ne sais quoi in the aroma.. that you just see in every Belgian witbier/saison on the market. Light amount of hoppy bitterness, on target with most saisons out there. Taste: The very first thing that popped out at me was "damn, the hops are pretty damned bitter in this brew!" Quite a bit of a piney hoppy backing to it, that leaves a bit of a bitter aftertaste after the sip has long been sampled. The Belgian yeasts also attribute to the bitterness in a sense. Profiles of coriander, orange peel and lemon citrus, some pear and a zest of the prairies. Overall Thoughts: Great hopped and sweet citrusy saison, surprised by the hops which is fairly rare to find in a saison, but very welcoming. Sweet notes of coriander, citrus, fruit and yeast. I wish there were more saisons out there, they still seem to find even though saisons really started to gain popularity around 2010 and every brewery seems to brew the stuff now.. but still.. oh so rare! 7.0% ABV.